I’M trying to empty my head because there are too many things in it. I don’t know about yours, but mine has a limited capacity and tends to overheat quickly. 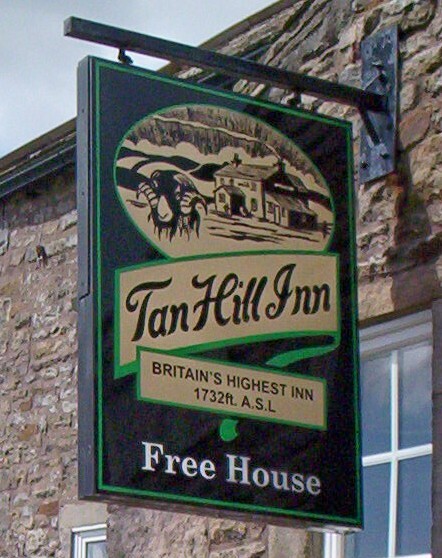 So in an attempt to purge the clutter, I’ve decided to jump on the road bike and pedal the 29.5 miles from my front door to England’s highest pub, the Tan Hill Inn . . . I have this theory – as yet unburdened by scientific disciplines – that when drifting beneath wide and empty skies across wide and empty moors, a man can cleanse his mind in a spiritual sort of fashion. The theory seemed pretty sound a couple of hours ago when I was eating my breakfast. Now that I’m battling into a strong headwind up an eternal and unforgiving slope, things don’t seem so appealing. It’s only after grunting over The Stang – the pass between Teesdale and Arkengarthdale – that the landscape acquires any sense of emptiness and desolation. 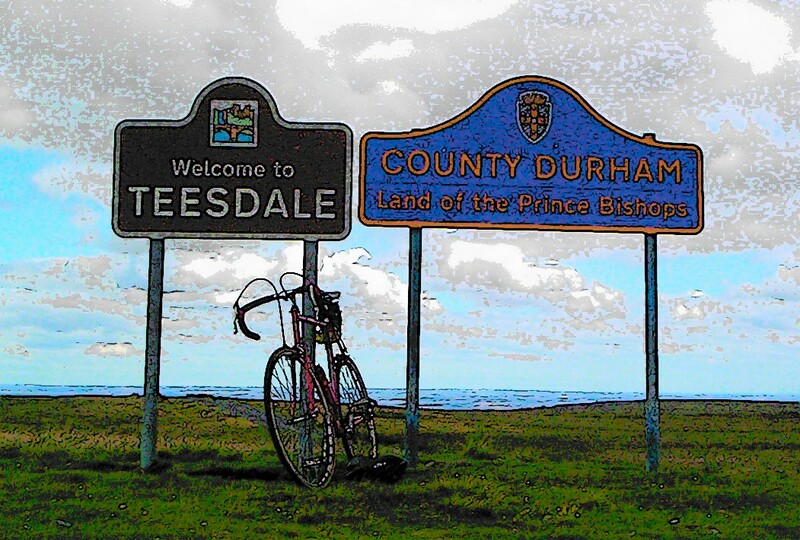 So I pedal on – a slow and relentless grind into a blustery westerly that does nothing to ease my mental state but plenty to make my legs hurt. At the Tan Hill Inn I sit in the sunshine clutching a mug of tea (£1.20 and thoroughly refreshing), chatting to a South African woman who is working in the pub on an exchange scheme before taking time out to travel the world. This legendary Pennine retreat, immortalised by the late Ted Moult and his double-glazing advert, is the first stop on her global tour. Soon she jets off to Venezuela to spend a few months exploring South America. “I’m following the summer around the world,” she says. I am immediately captivated by this notion of following the summer. This woman is a like a swallow or a swift, swooping on warm currents from one side of the equator to the other. I am uplifted by a sense of weightlessness. I take a different route home, peeling off the Arkengarthdale road a mile east of the Tan Hill and sailing down a rough track across the moors towards Gilmonby and Bowes. 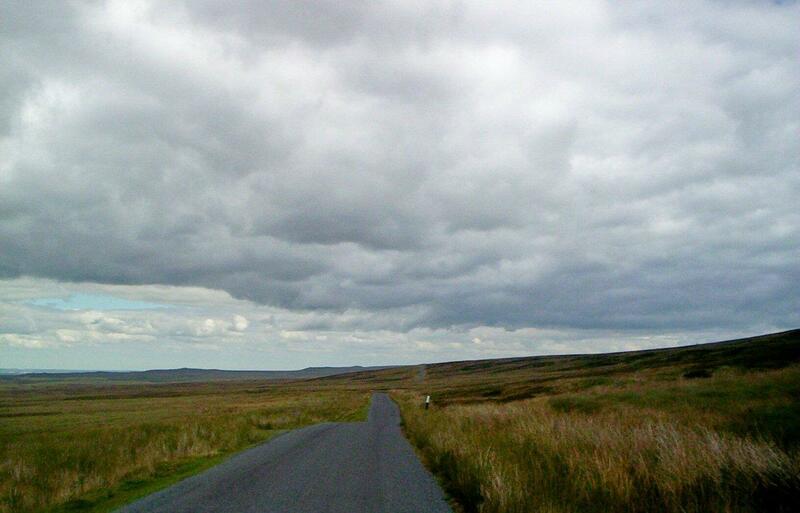 The Pennines here are wide and empty – and so are the skies. But emptiness alone is not sufficient to cleanse the mind, I decide. A man needs to swoop like a swallow and think swallow thoughts. Like Hermann Hesse’s Siddhartha watching a heron fly over a bamboo wood, he needs to feel the pangs of a swallow’s hunger and die a swallow’s death. Sometime later, while pedalling vacantly along quiet lanes, I sit up suddenly in the saddle and realise I don’t know where I am. These hedges, these fields, these farms and woods – they are unfamiliar. Then recognition seeps slowly back. I am on a road between the villages of Caldwell and Forcett – a road I have ridden a hundred times before. But for a few long and panicky seconds, I was completely thrown. Can swallows empty their heads too much, I wonder? Tweet tweet. Or is this an age thing? Allow me to present, courtesy of YouTube, the one and only Ted Moult at the Tan Hill Inn. 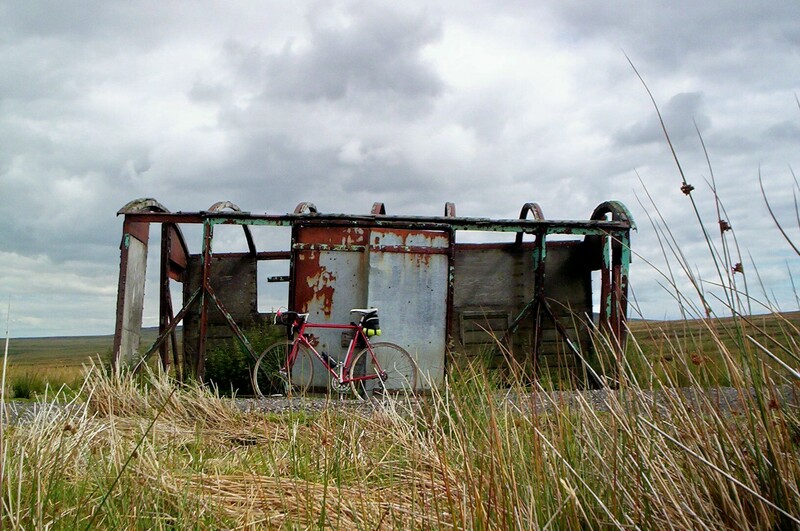 This entry was posted in Cycling, Environment, Hiking, Life, Mountains, Ranting, Tan Hill Inn, Walking, Writing and tagged Pennines. Bookmark the permalink. 9 Responses to Empty Skies, Empty Moors, Empty Head . . .
Did they still have the lambs inside the inn? It’s a wonderful refuge in a glorious location. 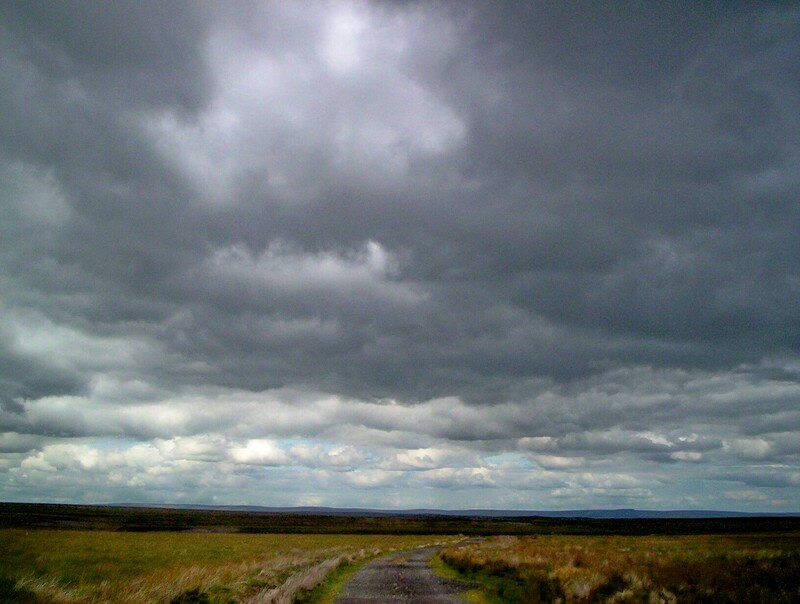 Sleightholme Moor with shower clouds racing overhead is a wild beautiful place. No lambs but plenty of tourists. Got any of that whisky left? Another great post. I sometimes almost convince myself that the mental anguish involved in an old fat bloke like me squeezing into lycra is something I could overcome with a little therapy. Then I read about the physical pain involved in going uphill and decide to stick to walking! Is that a cop out? Yes probably. The downhill bits are great. But I do wonder sometimes whether the pain and effort of the uphill bits are worth it. And when you see those blokes on the Tour de France sailing up ten-mile gradients in the Alps, it’s enough to make you lock your bike in the shed and throw the key away. But I must admit, where I live near Darlington it’s mostly flat. If you want hills you have to seek them out. So it’s probably me who needs therapy. Great post as always, I do love this bringing the bike to fell with you, it really is a fantastic idea especially when you are in the remote parts of Scotland or anywhere for that matter, knowing that your bike is going to be there for a down hill trek must be a great ending to an exhausting walk, I really am going to have to try it some day. There are walks where a bike comes in very handy, espacially in Scotland when you might have seven or eight miles of private estate track to cover before you get to the hills – and the same distance back at the end of the day. Mind you, there are plenty of people would disagree with this. Each to his own, that’s what I say. Thanks Mark. Funnily enough, I was toying with the idea of spending a Saturday night up at the Tan Hill with my wife and camping outside. I’ll pack the ear plugs. Of course,if you spend sufficient time in the pub before retiring, then you may not need to pack the ear plugs! !